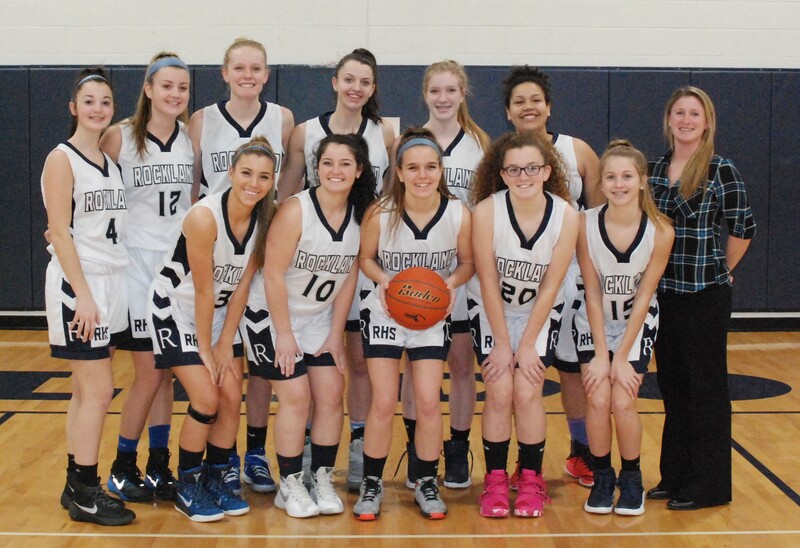 The Rockland girls varsity basketball team this year is looking very good, holding a record of 12-4 going into the last week of the regular season. They have also clinched at least a tie for the championship of the SSL Sullivan Division for the second year in a row with an 10-2 league record. They will win the title outright if they win on Thursday. Coach Diana Mitchell, captain Erika Ochenduszko, and teammate Adiza Alasa were interviewed by The Veritas this month about their formula for success. Another star player coming up is freshman center, Hannah Wylie. Coach Mitchell believes EVERY underclassman on the team can and, she hopes, will be a future star. She strongly believes they all have the ability, but it will depend on their individual work ethic. While Alasa does not think her team could win a state title this year, Ochenduszko thinks otherwise. She said she believes in her coach and her teammates and that they could be #1 in the state. Considering an unsung hero, Coach Mitchell had a hard time making a pick. The girls are hoping to finish strong with three nonleague games remaining. On Wednesday they play Arlington Catholic in Arlington. They will close out the regular season with a tournament at St. Mary’s Lynn on Feb. 19 and 20.